WATCH YOUR HOME FROM ANYWHERE--DON'T MISS A MINUTE Stream live HD video from your home right to your smartphone or tablet--no computer required. With the NetCam HD+, you can watch your kids playing or check in with elderly parents anytime, anywhere. Set up the camera in your living room, kitchen, child's bedroom, or anywhere you want to keep an eye on kids, elderly family members, and mischievous pets. glass lens GLASS LENS FOR VIBRANT, CLEAR PICTURE Capture every detail of the fun at home in vivid 720p HD. The camera's glass lens allows for vibrant color and pristine detail. You'll be able to see the smallest details, even on your smartphone's screen. CLOUD+ PREMIUM SERVICES EXPAND CAMERA'S CAPABILITIES Enjoy even more of the NetCam HD+'s features when you subscribe to Cloud+ Premium Services. This subscription allows you to record and store your favorite videos in the cloud, so you can enjoy them later. You can also receive notifications on your smartphone or tablet when the camera's motion sensor is triggered. The notifications include a video link, so you can watch the action without missing a beat. Try a complimentary 30-day subscription to start exploring all the advanced features right away. Effortless Setup - No Computer Required Forget hassling with installation CDs and complicated user manuals. 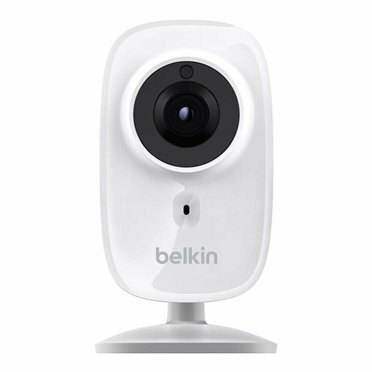 All you have to do to get the Belkin NetCam HD+ up and running is download the free NetCam app to your mobile device. The camera connects to your home's Wi-Fi router and starts streaming video and audio to your smartphone or tablet. You don't even need a computer or laptop. GET PEACE OF MIND WITH NIGHT VISION The camera's infrared night vision function lets you view HD video of your home or office regardless of what time it is. A Day/Night filter improves the picture on your device to give you detailed images, even if the room you're viewing is totally dark. Use the NetCam HD+ to make sure your child is peacefully asleep or to keep an eye on your home. Works with WeMo products: WeMo Switch, WeMo Motion Sensor, WeMo Insight Switch and WeMo Light Switch; sensing motion and lights come on automatically! Email alerts let you enjoy peace of mind with movement-detection notifications and built in push-to-talk microphone allows 2-way conversations. See who is at the front door while you are at work!